I think Papa is becoming a bit crazy. 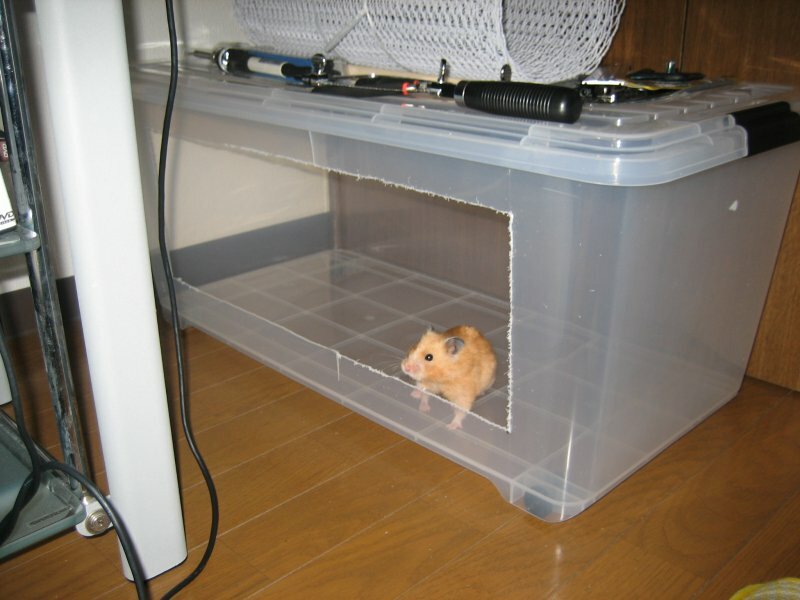 He bought two big plastic boxes somewhere and now he's opening these big holes on them. Maybe he doesn't he know that YOU CAN'T STORE THINGS ON A BOX IF IT'S OPEN ON THE SIDES! What could be thinking about...? Hmm, maybe you are going to have a nice new home? I love you Nana. You always bring a biig smile on my face when I come to look at your diary. I also have a hamster, he´s called Jairus. We live in Finland and here hamsters are very popular too. I´ve been watching this site from the beginning. Baru was so sweet little hammy. He had a good life. I`m so happy that your papa loves his hamsters so so much! Oh Nana watch you don't hurt yourself on them rough ages, i think your "papas" a bit stupid, you could easily hurt your paws on them edges!! Nana, did you look above you? Maybe the white wires have something to do with it. I do think you look very cute in the new plastic tub. heheh.. jeez that box is huge.. could it be another birthday present..?! Haha, happy belated birthday, Nana! ^_^ My hammies Peanut and Butter have a bin cage also! They love it, so I'm sure you will too. So nice and big! cute...i wonder what it could be.